Is traveling to Hong Kong included in your travel bucket list? Several airline companies are offering promo fares to this amazing destination and one of them is Philippine Airlines. The PAL Manila to Hong Kong seat sale are available for booking from June 2-4, 2017 as their PALmazing promo deals this weekend. The PAL promo is good for round trip travel inclusive of base fare, government taxes and fees and terminal fee. For Filipino nationals, travel to Hong Kong for tourism, business or transit does not require Visa as long as you will not stay for more than 14 days. So, are you interested on this promo? Do not wait too long to decide, sale tickets might be gone by then. 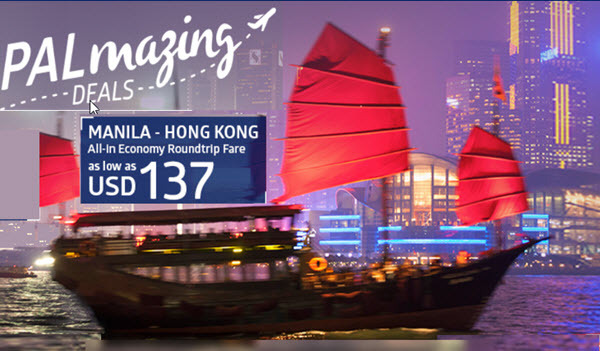 The Philippine Airlines Hong Kong promo fare ticket as low as USD137 is valid for flights PR312/313. Travel period for the promo is from June 2 until November 30, 2017. Book the PAL sale ticket at www.philippineairlines.com or your tour package via swingaround.philippineairlines.com. PAL affordable fare to Hong Kong cover free baggage allowance of 7 kilos for cabin baggage and 30 kilos checked baggage. Infants fare is 10% of adult ticket price while child ticket is 80% of adult fare rate. Book your Hong Kong trip now and enjoy! For more Philippine Airlines promo and other airline seat sale 2017 to 2018, LIKE and FOLLOW our Facebook: PISO FARE TICKET!! !